A team of researchers from China have conducted an experiment to synthesize castor oil based plasticizers containing flame retarded group and their use in poly vinyl chlor ide as a secondary plasticizer. Initially epoxidized castor oil (ECO) and castor oil phosphate ester (COPE) were synthesized and their structure was characterized. 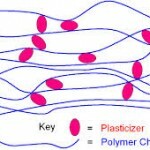 The property of PVC blends plasticized with ECO and COPE as a secondary plasticizer was studied. The results showed that the thermal stability of plasticized PVC blends was improved; the flame retardant performance of COPE was put into effect by promoting polymer carbonization and forming a consolidated and thick flame retardant coating. This entry was posted in Castor Research and tagged Castor Research by Gayathri. Bookmark the permalink.